We were appointed as landscape architects by our developer client on this residential development project with an element retail. Once our initial sketch landscape design was approved we proceeded with the preparation of a landscape architect ‘s tender package of information to enable the tender of the external works. Our scope included the production of a general arrangement drawing, a planting plan with schedules, technical sections and a full NBS specification. Coordination with other members of the design team and the existing on site conditions was an essential requirement. Our landscape design input into this project was limited to two main areas. These included the central courtyard space and two private patios to the rear of the development. As this was an infill site the development was bound on three sides by party walls. Our landscape design needed to consider this existing edge condition and treatment carefully. The central landscape space accommodated a communal courtyard through which all residents of the development must pass to access their dwelling. In addition a private patio for the ground floor residential unit facing this space was also accommodated. Within the communal space the civil engineer had located two surface water attenuation tanks. 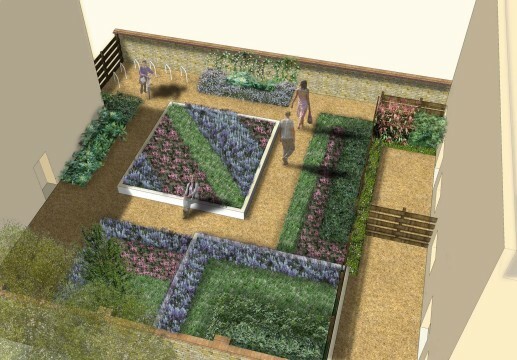 Our landscape design proposed two raised planters on top of these locations. These planters would provide attractive planting whilst making an attractive feature of this potentially ugly piece of infrastructure. The planting was carefully selected by our landscape architect so as to survive in this potentially shaded environment. A combination of evergreen and deciduous planting was chosen so as to provide all year round interest.